My 10-week program about creative expression, “Strings of Passion,” just started and still open for 2019 registration! I find myself so moved by what the members share about their discoveries in the course. Each time someone pulls out a quote, or restates it, it expands my own take on the concept. I’m also noticing how much difference it makes when we actively invest in our own learning. Simply by taking notes, keeping them somewhere we can review them and then reviewing them makes a huge difference. Sharing them and talking about them makes even MORE of a difference. You have to be willing to be “bad” at something before you can be “good” at something. Really embrace the “bad” stage. (like how I learned to ride a unicycle – just get back up again) # You don’t have to be perfect to connect to others with your music – You can learn, connect and express yourself w/out ever achieving perfection (It can still sound good) “Perfection is a real creativity killer!” Do a bad job & be OK with how things are. Don’t worry about it – just do it anyway! Instead of discarding a song once it’s learned, play the same tunes over & over = you can get deeper into that tune. Do what you CAN do at a deeper level. Build on that structure and keep expanding the possibilities. You can develop your playing on just one tune by exploring new characteristics to go with it. Playing beautifully slow is the goal, just like the other Harp Therapist do. Try to reach out to others with the feels of the musicality. Not everyone will be receptive to the music offerings you give. You can’t force them to like it. What works for me (to relax) may not work for someone else. The music can be not just “presented”, but felt when you intentionally add nice musicality to it. “Why do I try twice as hard to be half as good?” Embrace self as you are right now – at whatever level you are at. Create safe place to play with incorrect notes. Let go of what you don’t have & embrace what you do have right now at this moment. Let go of “where I should be at” and need to be perfect or playing “right notes”. Play simple & comfortable notes so you can connect to a person and be able to look them in the eye, and not focus on flashy playing. Really connect with what you already know/do. Use the skills you have right now – exactly the way you are. 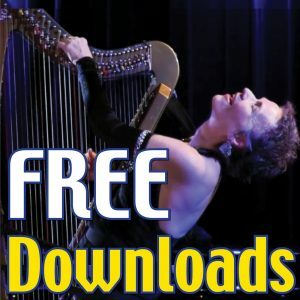 “If you’re not getting better at [harp playing] would you still do it?” Play for the love of harp playing & enjoy yourself, and to connect to inner self (not to perform & impress people). It’s about quality and not quantity playing. Let go of need to prove yourself or show off. How to address the Ick Pot thoughts that hold me back – have not taken time to address them thus far. The “What if UP?” game is a perfect solution to try and start addressing those issues at hand. Great idea! When you feel inhibited by something (i.e when you shrink inside of self), acknowledge it- explore it – exaggerate it- feel it- talk to it- then let it go and change/shift it. Bad stuff never goes away, but you can become friends with it and be comfortable with those things that inhibit you. Powerful tool to unshackle you from your own judgments & inhibitions is to suspend judgement of self and others artistic work. When you feel yourself disconnect, just find something you love about it. Find the value in it. Instead of envy or scared – apply love which alleviates the fear. Awareness will refocus you, and things appear to have changed. Allow yourself to share things imperfectly. Songs don’t necessarily have to be finished to share them. No one will say “you can do this & that better”. Most musicians play the modes differently than Harp players do(n’t). Each mode has a different focus of tonality, so you are going to play that mode differently than the Ionian because of where the half steps and whole steps are used. It’s going to have a different feel to it. Locrian mode is not used very often because of the tri-tone in it, so we use chords or arpeggios instead. Liken the diff modes to what we experience in life and how when you shift one mode, it shifts everything – we engage differently – we have a new perspective. (Like changing your mindset helps things get better.) Modes expand our expressions and makes us richer. A way to engage with what we CAN do with what we have; embrace simplicity helps us become more fluent. [Refine & Define – AS YOU ARE] Do what you need to do to experience fluency – whether it’s to slow it down, take notes out, or only play 2 modes instead of all 7 – so that it is a fun thing to play. Use the music in a way that makes you feel fluent with it and it enriches what you are doing. Flex those creative muscles at some sort of creativity gym every day! Find out what works for you. Create conditions for you to become more creative. How can you enhance that? One way to be able to leap gracefully from one mode to another, or change chord tonalities, is when you bring strong intentions to the music you are playing, it doesn’t matter about the obstacles, the music will be there. I can’t wait to see what else Martha finds in the program and I’m moved again by realizing how much we learn about ourselves whenever we create something new and share it with others – and see what happens, what rises to the surface, as they begin to make it their own. And how that, in turn, illuminates my own work. What are YOUR takeaways from THESE takeaways? What jumped out or jumped into your mind as you read these? Please share them in the comments below. And if you play the harp… If you do nothing else for yourself in 2019, discover YOUR strings of passion – the ones that resonate within you … and let them ring through your life and your creative expression. SIGN UP TODAY!